To Skottland on the "Ships starting with S" page. Manager: F. N. Nordbø, Haugesund. Tonnage: 2117 gt, 1217 net. Built by Meyer & Co.'s Scheepsbouw Mij. NV, Zalt-Bommel, Holland, delivered in Apr.-1920 as Stad Zwolle for N. V. Stoomboot Maatschapij Stad (Halcyon), Rotterdam. Purchased by F. N. Nordbø in 1939 and renamed Skottland. Forum message from Philip Seils, survivor of Skottland. Guestbook message from the son of Donkeyman Kaare Remme - see crew list below. Page 2 gives arrival Jan. 31. Her 1940 voyages are listed on Page 1 of the archive documents. It'll be noticed that she had quite a long stay in Phildadelphia that fall, with another long stop at New Orleans at the end of the year. This document also has some of her 1941 voyages, while the rest can be found on Page 2, which shows a long gap from Aug. 21-1941, when she had arrived Quebec; departure is given as Oct. 20, but it's possible some voyages are missing from the record(?). With a cargo of steel and lumber for London, she was scheduled for the slow Sydney (C.B.)-U.K. Convoy SC 53 on Nov. 4-1941, but did not sail, and was also cancelled from the next convoy, SC 54 (which was escorted by Eglantine and Montbretia for a while), but eventually got away with SC 55 on Nov. 16. Follow the links for more info, several Norwegian ships took part in these convoys. In Jan.-1942, she's listed in the westbound North Atlantic Convoy ON 55, originating in Liverpool on Jan. 8, dispersed on the 26th, Skottland arriving Halifax on Jan. 31, continuing to St. John, N.B. the next day (she had sailed from Loch Ewe on Jan. 9). With a cargo of flour for Glasgow, she headed back across the Atlantic on Febr. 16 in Convoy SC 70 from Halifax, arriving her destination on March 7, remaining there for a month, according to Page 2. She subsequently joined the westbound Convoy ON 84, which originated in Liverpool on Apr. 8 and arrived Halifax on the 25th; Skottland started out from Clyde on Apr. 9. These ON convoys will be added to individual pages in my Convoys section; in the meantime, the ships sailing in them (and escorts) are named in the section listing ships in all ON convoys. As will be seen, other Norwegian ships also took part. The rest of her voyages are shown on Page 3. From Halifax, Skottland had proceeded to St. John, N.B., then on to New York and Philadelphia, departing Philadelphia again on May 12-1942 at 19:00 for Halifax with a cargo of lumber in order to join a convoy for the U.K. She's said to have stopped at New York the following evening at 22:15 to embark the coastal pilot, then left New York on the 14th, maneuvering up Long Island Sound, following the pilot's directions (Page 3 gives departure Camden, N.J., May 13). She had to anchor up several times due to fog. At 16:20 on the 16th she arrived the Cape Cod Canal and by 18:20 she had sailed through, then continued as per instructions received from British Naval Authorities. She passed Cape Cod Light at 21:00 that evening. On board were 20 Norwegians, 2 Swedish, 1 British and 1 Canadian. At noon on May 17 the majority of them were on deck as they had just completed a gunnery drill, and with it being Norway's Constitution Day they were looking foreward to a special dinner in celebration of the day, but at 12:10 the ship was torpedoed on the port side, probably by 2 torpedoes, position 43 06N 67 20W*. The 1st torpedo hit aft between hatch No. 3 and 4, and the 2nd was assumed to have hit amidships in front of the fireroom. The U-boat (U-588 - Vogel) was never seen at any time, but the 1st mate, who was on the port side of the bridge, had seen the 2nd mate pointing to the port quarters; the latter was on the gun platform. The 3rd engineer was on duty in the engine room. At the maritime hearings he stated that the engine stopped immediately and all the lights went out. When steam started to gush into the room, presumably because the valves on top of the boiler were blown off, there was nothing else for him to do but to get to a lifeboat. The port lifeboat had been destroyed in the explosion, the motorboat capsized and was useless. The 23 survivors took to the starboard boat which was launched with great difficulty because of the heavy list to port**. By 12:35 the ship had disappeared; the last they saw of her was her bow. (The secret code books went down with the ship, but the captain, who had been on the bridge on the starboard side when the explosion occurred, was able to pick up other papers from his cabin before he joined the crew in the lifeboat). Some of the survivors were distributed on 2 rafts that were found floating nearby, whereupon the captain and the rest of the survivors rowed around the area to look for the missing Stoker Folke Norbin (Swedish) but saw no sign of him and it was assumed he had been killed in the explosion. * Position for the attack given in the official report is approximately 43 06N 67 20W. J. Rohwer gives 43 07N 67 18W. I've also seen 43 07N 65 18W. "Våre gamle skip" simply gives the position as 20 n. miles west/southwest of Cape Sable, Nova Scotia, adding she was on a voyage Camden, N. J.-London; again, see also Page 3. ** Philip Seils, one of the survivors (see his forum posting) remembers things a little differently. He has told me that at the time of attack they were travelling north, and he was on deck near the gun platform when someone said "what is that over there", while pointing to the starboard side. The next thing he knew he was lying on deck several feet away from where he had been standing. When he came to, Skottland was listing heavily to starboard. (All the reports I've seen on the sinking of Skottland say she was hit on the port side). The lifeboat was soon spotted by a Canadian aircraft, and after an hour the lobster boat O. K. Service IV from Nova Scotia (Captain S. E. Himmelman) came to assist and took them into Boston, where they arrived the following morning. An ambulance took 4 men to the hospital. 9 had been injured when they were thrown about in the explosion, most severely 1st Engineer Nils Olsen and Able Seaman Karl Myrseth. The Canadian Ordinary Seaman Edward Simard and Mess Boy Philip Seils had also been injured, but less severely. 2nd Mate Nils Ugstad and 2nd Engineer Harald Ludvigsen were also given medical treatment, but were not admitted to the hospital. The maritime hearings were held in New York on May 27-1942 with Captain Jensen, 1st Mate Konrad Næss, Ordinary Seaman Bjørn Stenlund (at the helm when attacked), Able Seaman/Gunner Ingvar Andersen and 3rd Engineer Olav Berg appearing. 1 of the survivors, Cook Oddvin Liseth had been in Norway when the Germans invaded on Apr. 9-1940, but had managed to escape to Lerwick in Nov.-1941 with the motor cutter Buestein. After the loss of Skottland, he joined Sønnavind then after having trained to become a gunner in Lunenburg he served on Roald Amundsen. In 1944 he joined M/S Narvik, and also served on Heimvard (after the war). Philip Seils mentions him in his posting to my "Find Old Shipmates" forum, and would like to get in touch again. If anybody knows Oddvin Liseth, please contact me via the address provided at the end of this page. For info, the U-boat that sank Skottland was sunk with all hands just a couple of months later - see the external links at the end of this page. Bjørn Stenlund's other ships are named on this external page. *Ref. Guestbook message from his son. Back to Skottland on the "Ships starting with S" page. Other ships by this name: This company had previously had another steamer by the name Skottland, delivered in 1919 as Elvier, Llloyd Belge Royal Soc. An., Antwerp, 735 gt. 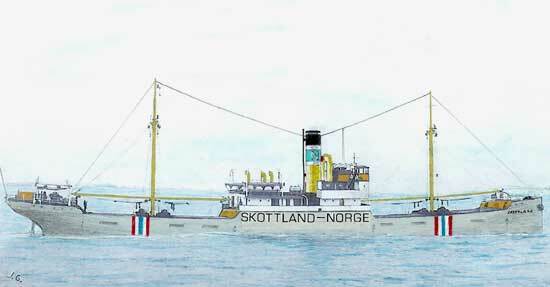 Purchased in 1936 by F. N. Nordbø A/S from owners in Newcastle and renamed Skottland. Ran aground in the harbour of Roquejada and sank on Jan. 1-1938 near Cabo Mayor on a voyage Roquejada, North Spain - Tonnay-Charente, France. In 1948 D/S A/S Skottland (F. N. Nordbø) bought a ship which had originally been delivered in Oct.-1922 as Valencia, Robert M. Sloman jr., Hamburg, 3119 gt, renamed Skottland. From 1954 this ship sailed as Ulla for I/S Hellesen & Vollmond, Copenhagen, then under German flag as Senior of Hamburg. Sold in 1960 for breaking up at Logements, Tripoli. ("Våre gamle skip"). The text on this page was compiled with the help of: "Nortraships flåte", J. R. Hegland, "Krigsseileren", Issue No. 2 for 1975, "Sjøforklaringer fra 2. verdenskrig", Norwegian Maritime Museum, Volume II, "Våre gamle skip", L. M. Bjørkelund & E. H. Kongshavn, and misc - ref My sources.